Know Web Design Trends? Then Take a Chance to Win an Exclusive Playing Card Deck! If you are a web designer, a strong knowledge of web design trends and their history is important. Not so long ago, Templatemonster.com created an interactive Infographic describing the main web design trends from 2004 to 2015. We suggest that you to take some time to review. Right now we will give you a hint that this information will come in handy for passing the quiz and winning the prize… But let us tell you about that a little later and draw your attention, right now, to the Infographic. Actually the Infographic to which we are referring explains web design trends from 2004 to 2015. Five major trends applicable to each particular year appear on hovering, except for 2015 which shows only 4 trends. The trends are well explained and come with 5 examples of live websites illustrating each trend. Now let’s talk about the quiz and why you should enter it. 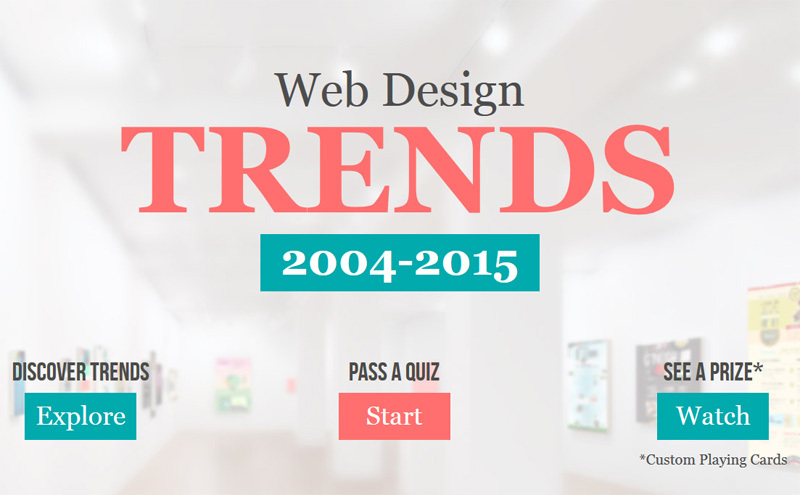 First of all, the quiz allows you to check your knowledge of web design trends. The best thing is that it gives you a chance to win custom playing cards that any designer might like to have. The quiz consists of 7 simple questions. If you give at least 3 correct answers you will receive a cool badge of “Web Design Guru” and will be automatically added to the list of candidates competing for the cards. (There will be 7 winners in 7 days). By participating in the quiz from the 26th of May 2015 to the 2nd of June 2015, you will have the opportunity of winning a custom designed deck of cards. Of course it’s not a simple pack of playing cards, although you can play or do whatever you wish with them. It’s an exclusive deck of cards illustrating the main web design trends for the last 12 years. Their creation has been inspired by the Infographic we’ve described above. The creative set includes 52 cards with unique designs. Card backs are created in material design style. Are you interested to participate in the quiz and have a chance of winning one of 7 custom-made web design card decks? Then, follow this link and enter!